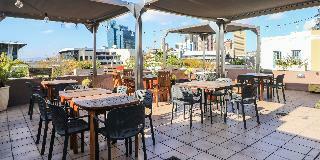 The hotel is located in the heart of De Waterkant, tucked between Signal Hill, the central business district and the Victoria and Alfred Waterfront, all within walking distance. 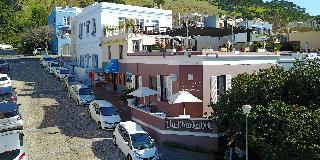 It borders the Cape Town 2010 Fan Mile and is within walking distance of Green Point Stadium. 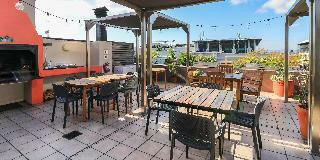 The beach is roughly 10 km away and Cape Town International Airport is situated at a distance of approximately 25 km.||This city hotel is a private, intimate and original guesthouse. It entertains and delights guests. From the roof decks of the hotel, guests can enjoy beautiful city views, especially in the late afternoons when the city lights up and the evenings come alive. 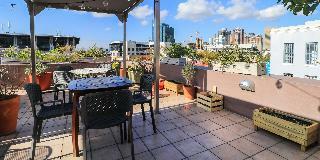 Comprising 11 rooms, the property offers a lobby, bar, wireless Internet access and a laundry service.||Each room has an individual arrangement and design, and the multi-levelled layout of the guesthouse is joined by inner and outer staircases. The rooms feature a refreshment station with tea and coffee making facilities, a mini fridge (except in traveller's rooms), selected satellite television, a safe, a hairdryer and a DVD player. They also contain ceiling fans or individually regulated air conditioning and built-in wall heaters, on request. 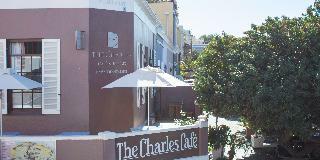 The en suite bathrooms are fitted with a shower and a bathtub.||Guests can enjoy breakfast at the Village Café, situated on the corner of Napier and Waterkant Street.||Exit the airport in the direction of the N2 Cape Town, and as guests approach the city, follow the N2 City, Foreshore, Sea Point signage. Follow the N2 Stad/City signs for 22 km until guests arrive at the Coen Steytler Avenue traffic lights. Proceed straight over the intersection. Cross over two more intersections and at the third traffic lights, Strand Street, turn right. Turn into the fourth road to the right, Loader Street. Almost immediately, the road makes a 90-degree turn to the left. 1 Loader Street is on the corner, on the left hand side.